In John 10, Jesus describes the ideal shepherd. He knows his sheep and his sheep know him. They follow him because they recognize his voice. Recently, I had a conversation with a friend about passage. She grew up on a farm where her family raised livestock, including sheep. She explained that over time, sheep come to associate the sound of the shepherd’s voice (or even whistle) with certain benefits. Contrary to popular opinion, sheep aren’t dumb. They know who feeds them, protects them, and cares for their needs. They can distinguish their keeper’s voice from others. But what about newborn lambs? How do they learn to recognize the shepherd’s voice? My friend confirmed my suspicions. From birth, lambs are conditioned to follow the flock. Sheep get a bad rap for their herd mentality, but God created them with an instinct to stick together as a means of survival. That instinct allows the lambs to flourish. Even sheep that are introduced to a new flock will follow the other sheep until they too recognize the shepherd. I think that’s a great picture of discipleship. As disciple-makers, we help others learn to recognize the voice of our Savior. The body of Christ is like that flock of sheep. We bring along non-believers and new believers, walk beside them, lead them, teach them, and always point them to Jesus. 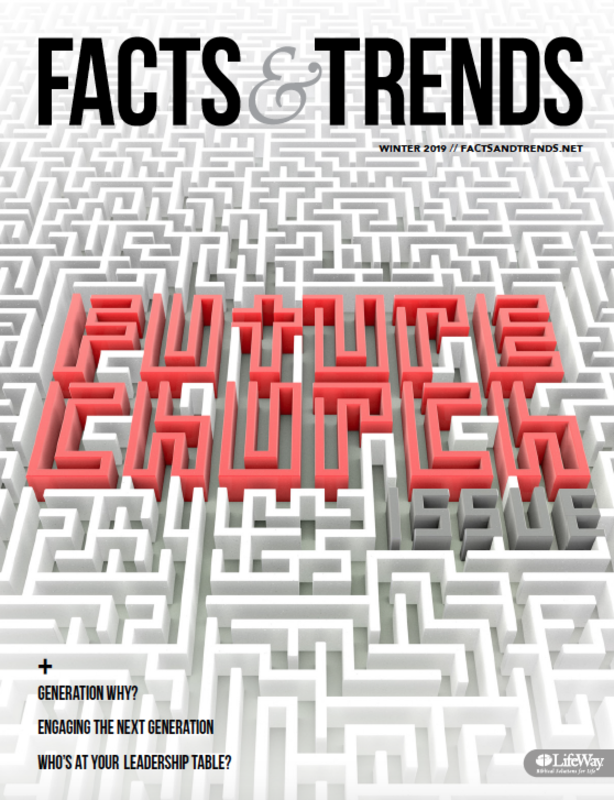 In this issue of Facts & Trends, we look at what it takes to make disciples. Many Christians want to grow close to God, but they don’t know where to start, says pastor Robby Gallaty in our cover story. Many churches struggle to fulfill the one central task of the Christian life: making disciples. With that in mind, we asked several Christian leaders to share how they lead people to disciple others. We hope you find encouragement as well as some practical ways to create a culture of discipleship in your churches. In the Great Commission, Jesus told his followers to “make disciples of all nations, baptizing them in the name of the Father and of the Son and of the Holy Spirit, teaching them to observe everything I have commanded you” (Matthew 28:19-20). While churches know how to baptize people and teach them about Jesus, they don’t always disciple them well, says Claude King, a discipleship specialist at LifeWay. King says pastors often teach people what to believe, but don’t always help them put those beliefs into practice. Discipleship involves both learning and doing, says King. Combining the two can help people grow spiritually. The goal is to make disciples who become more Christlike—who act and love as Christ did. An effective discipleship strategy begins with that goal in mind. Most church leaders want to see the people who attend their churches grow into fully committed followers of Christ. Unfortunately, many churches do not have a clear process for discipleship with clear expectations for members. In the industrialized West, we see this as an assembly-line process. A lost individual begins the process and, after going through specific stops along the way, a fully developed disciple emerges at the end of the line. Evangelism is distinct from discipleship, which is distinct from missions. But is that really what Jesus is communicating to His disciples gathered on the mountain at the end of Matthew’s Gospel? Instead of seeing disciple-making as a series of steps, I believe there is a better approach. Look again at Matthew 28:19-20. Let’s not give up meeting together. Let’s instead understand the essential nature of these meetings for discipleship, for mirroring God’s image, and for reminding us of that which we are so prone to forget. I understand why Jesus strategically poured himself into a handful of disciples. Through a personal relationship with these carefully and prayerfully selected men, He led them to salvation and spiritual maturity. As a result, they turned the world upside down (Acts 17:6). Now That I Believe, What’s Next? Disciples of Jesus can spend countless hours studying the basic doctrines of our faith, learning methods for evangelism, engaging in meaningful conversations, serving to meet people’s needs, and more—all for the privilege of witnessing the miracle of those who are spiritually dead in their sins becoming born again through the power of Christ. That isn’t the end of the process, however—far from it. Like a new mother cradling her baby, we aren’t finished with our work when someone we care about experiences the joy of new life in Christ. In fact, our work has just begun. Life is Short. Make a Difference. Most of our congregations need to change. Many of our congregations are on life support and need immediate change. The great need in our churches is for change leaders who are willing to make a difference. The cost and the risks can be scary. But it wouldn’t be called faith if we could tackle these challenges in our own strength and power. It is a sin to be good when God has called us to be great. We need change leaders in our churches who are willing to do something great. To become mature, disciples need a clear and simple path. That’s the idea behind the Disciples Path, a six-part study from LifeWay designed to help Christians move from new believers to disciple-makers.